Proprietary Name: Hydrea What is the Proprietary Name? Non-Proprietary Name: Hydroxyurea What is the Non-Proprietary Name? 0003 - E.r. Squibb & Sons, L.l.c. Hydrea with NDC 0003-0830 is a a human prescription drug product labeled by E.r. Squibb & Sons, L.l.c.. The generic name of Hydrea is hydroxyurea. The product's dosage form is capsule and is administered via oral form. Labeler Name: E.r. Squibb & Sons, L.l.c. FDA Application Number: NDA016295 What is the FDA Application Number? Start Marketing Date: 06-01-2009 What is the Start Marketing Date? Why is hydroxyurea medication prescribed? HYDREA is indicated for the treatment of: •Resistant chronic myeloid leukemia. •Locally advanced squamous cell carcinomas of the head and neck (excluding the lip) in combination with chemoradiation. HYDREA is used alone or in conjunction with other antitumor agents or radiation therapy to treat neoplastic diseases. Individualize treatment based on tumor type, disease state, response to treatment, patient risk factors, and current clinical practice standards.Base all dosage on the patient’s actual or ideal weight, whichever is less.HYDREA is a cytotoxic drug. Follow applicable special handling and disposal procedures [see References (15)].Patients should swallow HYDREA capsules whole and not to open, since hydroxurea is a cytotoxic drug.Prophylactic administration of folic acid is recommended [see Warnings and Precautions (5.7)]. Monitor for the following and reduce the dose or discontinue HYDREA accordingly: Myelosuppression [see Warnings and Precautions (5.1)] Cutaneous vasculitis [see Warnings and Precautions (5.4)]Monitor blood counts at least once a week during HYDREA therapy. Severe anemia must be corrected before initiating therapy with HYDREA. Consider dose modifications for other toxicities. Reduce the dose of HYDREA by 50% in patients with measured creatinine clearance of less than 60 mL/min or with end-stage renal disease (ESRD) [see Use in Specific Populations (8.6) and Clinical Pharmacology (12.3)].Creatinine Clearance(mL/min)Recommended HYDREA Initial Dose(mg/kg once daily)≥6015<60 or ESRD*7.5* On dialysis days, administer HYDREA to patients following hemodialysis.Close monitoring of hematologic parameters is advised in these patients. 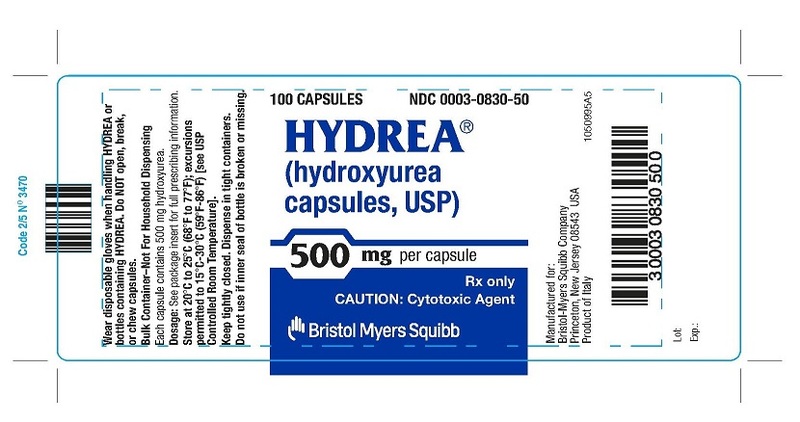 HYDREA is contraindicated in patients who have demonstrated a previous hypersensitivity to hydroxyurea or any other component of the formulation. Hydroxyurea causes severe myelosuppression. Treatment with hydroxyurea should not be initiated if bone marrow function is markedly depressed. Bone marrow suppression may occur, and leukopenia is generally its first and most common manifestation. Thrombocytopenia and anemia occur less often and are seldom seen without a preceding leukopenia. Bone marrow depression is more likely in patients who have previously received radiotherapy or cytotoxic cancer chemotherapeutic agents; use hydroxyurea cautiously in such patients.Evaluate hematologic status prior to and during treatment with HYDREA. Provide supportive care and modify dose or discontinue HYDREA as needed. Recovery from myelosuppression is usually rapid when therapy is interrupted. Hydroxyurea is a human carcinogen. In patients receiving long-term hydroxyurea for myeloproliferative disorders, secondary leukemia has been reported. Skin cancer has also been reported in patients receiving long-term hydroxyurea. Advise protection from sun exposure and monitor for the development of secondary malignancies. Based on the mechanism of action and findings in animals, HYDREA can cause fetal harm when administered to a pregnant woman. Hydroxyurea was embryotoxic and teratogenic in rats and rabbits at doses 0.8 times and 0.3 times, respectively, the maximum recommended human daily dose on a mg/m2 basis. Advise pregnant women of the potential risk to a fetus [see Use in Specific Populations (8.1)].Advise females of reproductive potential to use effective contraception during and after treatment with HYDREA for at least 6 months after therapy. Advise males of reproductive potential to use effective contraception during and after treatment with HYDREA for at least 1 year after therapy [see Use in Specific Populations (8.1,8.3)]. Cutaneous vasculitic toxicities, including vasculitic ulcerations and gangrene, have occurred in patients with myeloproliferative disorders during therapy with hydroxyurea. These vasculitic toxicities were reported most often in patients with a history of, or currently receiving, interferon therapy. If cutaneous vasculitic ulcers occur, institute treatment and discontinue HYDREA. Avoid use of live vaccine in patients taking HYDREA. Concomitant use of HYDREA with a live virus vaccine may potentiate the replication of the virus and/or may increase the adverse reaction of the vaccine because normal defense mechanisms may be suppressed by HYDREA. Vaccination with live vaccines in a patient receiving HYDREA may result in severe infection. Patient’s antibody response to vaccines may be decreased. Consider consultation with a specialist. Pancreatitis, hepatotoxicity, and peripheral neuropathy have occurred when hydroxyurea was administered concomitantly with antiretroviral drugs, including didanosine and stavudine [see Drug Interactions (7.1)]. Patients who have received irradiation therapy in the past may have an exacerbation of post-irradiation erythema. Monitor for skin erythema in patients who previously received radiation and manage symptomatically. HYDREA may cause macrocytosis, which is self-limiting, and is often seen early in the course of treatment. The morphologic change resembles pernicious anemia, but is not related to vitamin B12 or folic acid deficiency. This may mask the diagnosis of pernicious anemia. Prophylactic administration of folic acid is recommended. Interference with Uric Acid, Urea, or Lactic Acid Assays is possible, rendering falsely elevated results of these in patients treated with hydroxyurea [see Drug Interactions (7.2)]. 6.1 Postmarketing ExperienceThe following adverse reactions have been identified during post-approval use of HYDREA. Because these reactions are reported voluntarily from a population of uncertain size, it is not always possible to reliably estimate their frequency.Reproductive System and Breast disorders: azoospermia, and oligospermiaGastrointestinal disorders: stomatitis, nausea, vomiting, diarrhea, and constipationMetabolism and Nutrition disorders: anorexia, tumor lysis syndromeSkin and subcutaneous tissue disorders: maculopapular rash, skin ulceration, dermatomyositis-like skin changes, peripheral and facial erythema, hyperpigmentation, nail hyperpigmentation, atrophy of skin and nails, scaling, violet papules, and alopeciaRenal and urinary disorders: dysuria, elevations in serum uric acid, blood urea nitrogen (BUN), and creatinine levelsNervous system disorders: headache, dizziness, drowsiness, disorientation, hallucinations, and convulsionsGeneral Disorders: fever, chills, malaise, edema, and astheniaHepatobiliary disorders: elevation of hepatic enzymes, cholestasis, and hepatitisRespiratory disorders: diffuse pulmonary infiltrates, dyspnea, and pulmonary fibrosisHypersensitivity: Drug-induced fever (pyrexia) (>39°C, >102°F) requiring hospitalization has been reported concurrently with gastrointestinal, pulmonary, musculoskeletal, hepatobiliary, dermatological or cardiovascular manifestations. Onset typically occurred within 6 weeks of initiation and resolved upon discontinuation of hydroxyurea. Upon re-administration fever re-occurred typically within 24 hours.Adverse reactions observed with combined hydroxyurea and irradiation therapy are similar to those reported with the use of hydroxyurea or radiation treatment alone. These effects primarily include bone marrow depression (anemia and leukopenia), gastric irritation, and mucositis. Almost all patients receiving an adequate course of combined hydroxyurea and irradiation therapy will demonstrate concurrent leukopenia. Platelet depression (<100,000 cells/mm3) has occurred in the presence of marked leukopenia. HYDREA may potentiate some adverse reactions usually seen with irradiation alone, such as gastric distress and mucositis. In patients with HIV infection during therapy with hydroxyurea and didanosine, with or without stavudine, fatal and nonfatal pancreatitis have occurred. Hydroxyurea is not indicated for the treatment of HIV infection; however, if patients with HIV infection are treated with hydroxyurea, and in particular, in combination with didanosine and/or stavudine, close monitoring for signs and symptoms of pancreatitis is recommended. Permanently discontinue therapy with hydroxyurea in patients who develop signs and symptoms of pancreatitis. Hepatotoxicity and hepatic failure resulting in death have been reported during postmarketing surveillance in patients with HIV infection treated with hydroxyurea and other antiretroviral drugs. Fatal hepatic events were reported most often in patients treated with the combination of hydroxyurea, didanosine, and stavudine. Avoid this combination. Peripheral neuropathy, which was severe in some cases, has been reported in patients with HIV infection receiving hydroxyurea in combination with antiretroviral drugs, including didanosine, with or without stavudine. Studies have shown that there is an analytical interference of hydroxyurea with the enzymes (urease, uricase, and lactate dehydrogenase) used in the determination of urea, uric acid, and lactic acid, rendering falsely elevated results of these in patients treated with hydroxyurea. HYDREA can cause fetal harm based on findings from animal studies and the drug’s mechanism of action [see Clinical Pharmacology (12.1)]. There are no data with HYDREA use in pregnant women to inform a drug-associated risk. In animal reproduction studies, administration of hydroxyurea to pregnant rats and rabbits during organogenesis produced embryotoxic and teratogenic effects at doses 0.8 times and 0.3 times, respectively, the maximum recommended human daily dose on a mg/m2 basis (see Data). Advise women of the potential risk to a fetus and to avoid becoming pregnant while being treated with HYDREA.In the U.S. general population, the estimated background risk of major birth defects and miscarriage in clinically recognized pregnancies is 2%–4% and 15%–20%, respectively. Hydroxyurea is excreted in human milk. Because of the potential for serious adverse reactions in a breastfed infant from hydroxyurea, including carcinogenicity, discontinue breastfeeding during treatment with HYDREA. Hydroxyurea has been demonstrated to be a potent teratogen in a wide variety of animal models, including mice, hamsters, cats, miniature swine, dogs, and monkeys at doses within 1-fold of the human dose given on a mg/m2 basis. Hydroxyurea is embryotoxic and causes fetal malformations (partially ossified cranial bones, absence of eye sockets, hydrocephaly, bipartite sternebrae, missing lumbar vertebrae) at 180 mg/kg/day (about 0.8 times the maximum recommended human daily dose on a mg/m2 basis) in rats and at 30 mg/kg/day (about 0.3 times the maximum recommended human daily dose on a mg/m2 basis) in rabbits. Embryotoxicity was characterized by decreased fetal viability, reduced live litter sizes, and developmental delays. Hydroxyurea crosses the placenta. Single doses of ≥375 mg/kg (about 1.7 times the maximum recommended human daily dose on a mg/m2 basis) to rats caused growth retardation and impaired learning ability. Verify the pregnancy status of females of reproductive potential prior to initiating HYDREA therapy. HYDREA can cause fetal harm when administered to a pregnant woman [see Use in Specific Populations (8.1)]. Advise females of reproductive potential to use effective contraception during and after treatment with HYDREA for at least 6 months after therapy. Advise females to immediately report pregnancy. HYDREA may damage spermatozoa and testicular tissue, resulting in possible genetic abnormalities. Males with female sexual partners of reproductive potential should use effective contraception during and after treatment with HYDREA for at least 1 year after therapy [see Nonclinical Toxicology (13.1)]. Based on findings in animals and humans, male fertility may be compromised by treatment with HYDREA. Azoospermia or oligospermia, sometimes reversible, has been observed in men. Inform male patients about the possibility of sperm conservation before the start of therapy [see Adverse Reactions (6) and Nonclinical Toxicology (13.1)]. Elderly patients may be more sensitive to the effects of hydroxyurea, and may require a lower dose regimen. Hydroxyurea is excreted by the kidney, and the risk of adverse reactions to this drug may be greater in patients with impaired renal function. Because elderly patients are more likely to have decreased renal function, care should be taken in dose selection, and it may be useful to monitor renal function [see Dosage and Administration (2.3)]. The exposure to hydroxyurea is higher in patients with creatinine clearance of less than 60 mL/min or in patients with end-stage renal disease (ESRD). Reduce dosage and closely monitor the hematologic parameters when HYDREA is to be administered to these patients [see Dosage and Administration (2.3) and Clinical Pharmacology (12.3)]. The precise mechanism by which hydroxyurea produces its antineoplastic effects cannot, at present, be described. However, the reports of various studies in tissue culture in rats and humans lend support to the hypothesis that hydroxyurea causes an immediate inhibition of DNA synthesis by acting as a ribonucleotide reductase inhibitor, without interfering with the synthesis of ribonucleic acid or of protein. This hypothesis explains why, under certain conditions, hydroxyurea may induce teratogenic effects.Three mechanisms of action have been postulated for the increased effectiveness of concomitant use of hydroxyurea therapy with irradiation on squamous cell (epidermoid) carcinomas of the head and neck. In vitro studies utilizing Chinese hamster cells suggest that hydroxyurea (1) is lethal to normally radioresistant S-stage cells, and (2) holds other cells of the cell cycle in the G1 or pre-DNA synthesis stage where they are most susceptible to the effects of irradiation. The third mechanism of action has been theorized on the basis of in vitro studies of HeLa cells. It appears that hydroxyurea, by inhibition of DNA synthesis, hinders the normal repair process of cells damaged but not killed by irradiation, thereby decreasing their survival rate; RNA and protein syntheses have shown no alteration. Following oral administration of HYDREA, hydroxyurea reaches peak plasma concentrations in 1 to 4 hours. Mean peak plasma concentrations and AUCs increase more than proportionally with increase of dose.There are no data on the effect of food on the absorption of hydroxyurea. Hydroxyurea distributes throughout the body with a volume of distribution approximating total body water.Hydroxyurea concentrates in leukocytes and erythrocytes. Up to 60% of an oral dose undergoes conversion through saturable hepatic metabolism and a minor pathway of degradation by urease found in intestinal bacteria. In patients with sickle cell anemia, the mean cumulative urinary recovery of hydroxyurea was about 40% of the administered dose. The effect of renal impairment on the pharmacokinetics of hydroxyurea was assessed in adult patients with sickle cell disease and renal impairment. Patients with normal renal function (creatinine clearance [CrCl] >80 mL/min), mild (CrCl 50‑80 mL/min), moderate (CrCl = 30-<50 mL/min), or severe (<30 mL/min) renal impairment received a single oral dose of 15 mg/kg hydroxyurea. Patients with ESRD received two doses of 15 mg/kg separated by 7 days; the first was given following a 4-hour hemodialysis session, the second prior to hemodialysis. The exposure to hydroxyurea (mean AUC) in patients with CrCl <60 mL/min and those with ESRD was 64% higher than in patients with normal renal function (CrCl >60 mL/min). Reduce the dose of HYDREA when it is administered to patients with creatinine clearance of <60 mL/min or with ESRD following hemodialysis [see Dosage and Administration (2.3) and Use in Specific Populations (8.6)]. Conventional long-term studies to evaluate the carcinogenic potential of hydroxyurea have not been performed. However, intraperitoneal administration of 125 to 250 mg/kg hydroxyurea (about 0.6-1.2 times the maximum recommended human oral daily dose on a mg/m2 basis) thrice weekly for 6 months to female rats increased the incidence of mammary tumors in rats surviving to 18 months compared to control. Hydroxyurea is mutagenic in vitro to bacteria, fungi, protozoa, and mammalian cells. Hydroxyurea is clastogenic in vitro (hamster cells, human lymphoblasts) and in vivo (SCE assay in rodents, mouse micronucleus assay). Hydroxyurea causes the transformation of rodent embryo cells to a tumorigenic phenotype.Hydroxyurea administered to male rats at 60 mg/kg/day (about 0.3 times the maximum recommended human daily dose on a mg/m2 basis) produced testicular atrophy, decreased spermatogenesis, and significantly reduced their ability to impregnate females. HYDREA® (hydroxyurea capsules, USP) is supplied as 500 mg capsules in HDPE bottles with a plastic safety screw cap. Each bottle contains 100 capsules. The cap is opaque green and the body is opaque pink. The capsules are imprinted on both sections with “HYDREA” and “830” in black ink (NDC 0003-0830-50). Store at 25°C (77°F); excursions permitted to 15°C-30°C (59°F-86°F) [see USP Controlled Room Temperature]. Keep tightly closed. HYDREA is a cytotoxic drug. Follow applicable special handling and disposal procedures [see References (15)].To decrease the risk of contact, advise caregivers to wear disposable gloves when handling HYDREA or bottles containing HYDREA. Wash hands with soap and water before and after contact with the bottle or capsules when handling HYDREA. Do not open HYDREA capsules. Avoid exposure to crushed or opened capsules. If contact with crushed or opened capsules occurs on the skin, wash affected area immediately and thoroughly with soap and water. If contact with crushed or opened capsules occurs on the eye(s), the affected area should be flushed thoroughly with water or isotonic eyewash designated for that purpose for at least 15 minutes. If the powder from the capsule is spilled, immediately wipe it up with a damp disposable towel and discard in a closed container, such as a plastic bag; as should the empty capsules. The spill areas should then be cleaned three times using a detergent solution followed by clean water. Keep the medication away from children and pets. Contact your doctor for instructions on how to dispose of outdated capsules. There is a risk of myelosuppression. Monitoring blood counts weekly throughout the duration of therapy should be emphasized to patients taking HYDREA [see Warnings and Precautions (5.1)]. Advise patients to report signs and symptoms of infection or bleeding immediately.Advise patients that there is a risk of cutaneous vasculitic toxicities and secondary malignancies including leukemia and skin cancers [see Warnings and Precautions (5.2, 5.4)].Advise females of reproductive potential of the potential risk to a fetus and to inform their healthcare provider of a known or suspected pregnancy. Advise females and males of reproductive potential to use contraception during and after treatment with HYDREA [see Warnings and Precautions (5.3) and Use in Specific Populations (8.1, 8.3)].Advise patients to inform their healthcare provider if they have received or are planning to receive vaccinations while taking HYDREA as this may result in a severe infection [see Warnings and Precautions (5.5)].Advise females to discontinue breastfeeding during treatment with HYDREA [see Use in Specific Populations (8.2)].Patients with HIV infection should contact their physician for signs and symptoms of pancreatitis, hepatic events, and peripheral neuropathy [see Warnings and Precautions (5.6)].Post-irradiation erythema can occur in patients who have received previous irradiation therapy [see Warnings and Precautions (5.7)].